A volunteer working with the NASA-led Backyard Worlds: Planet 9 project has found the oldest and coldest known white dwarf - an old Earth-sized remnant of a sun-like star that has died - ringed by dust and debris. Astronomers suspect this could be the first known white dwarf with multiple dust rings. The star, LSPM J0207+3331 or J0207 for short, is forcing researchers to reconsider models of planetary systems and could help us learn about the distant future of our solar system. Adam Schneider, a research scientist at Arizona State University's School of Earth and Space Exploration, was part of the team that unwrapped the discovery data to draw a picture of the white dwarf's surprising details. Backyard Worlds: Planet 9 is a project led by Marc Kuchner, an astrophysicist at NASA's Goddard Space Flight Center. Launched two years ago, it enlists volunteers to sort through infrared data for new discoveries using an online interface and search engine. "This object was found by Melina Thevenot of Germany using the Backyard Worlds project," he said. "She originally thought it might be a cold brown dwarf, something the project is very interested in and has had a lot of success finding." Brown dwarfs are low-temperature objects too big to be planets yet too small to be stars. They shine dimly at far infrared wavelengths and because of their low luminosity, all those known lie relatively close to the sun. 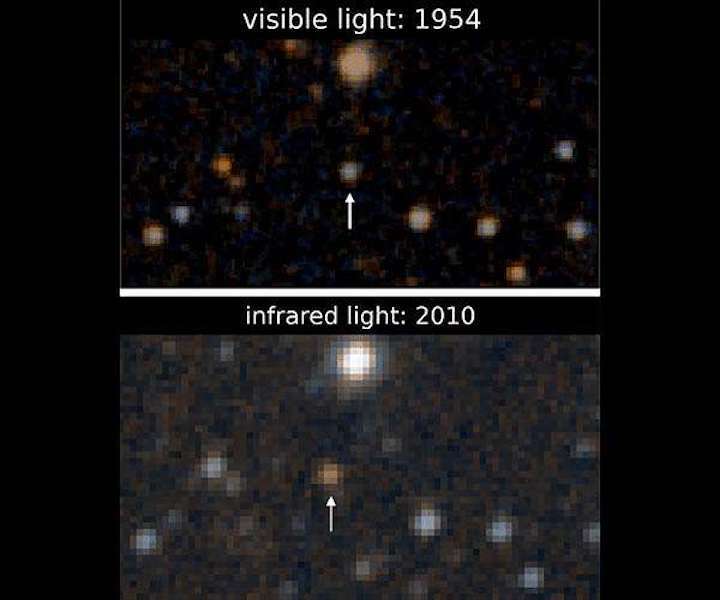 "When Melina investigated further, she found that although the object had significant infrared brightness; it was not a nearby brown dwarf," Schneider said. Instead it had to be something brighter and farther away, and the best candidate was a stellar evolution remnant: a white dwarf star. "The team looked at it together, and we determined it was likely a white dwarf with infrared excess," said Schneider. The excess was believed to be radiating from a warm, dusty circumstellar disk. Such disks are thought to result from the continual breakup of small rocky planetesimals orbiting the white dwarf. Yet with an age of roughly 3 billion years, J0207 is colder and nearly three times older than any other white dwarf known to harbor such a disk. "However, we were brown dwarf experts and not white dwarf experts, so we needed to 'phone-a-friend' and contacted white dwarf expert John Debes for help interpreting what Melina had found," said Schneider. Debes is an astronomer at the Space Telescope Science Institute in Baltimore. "This white dwarf is so old that whatever process is feeding material into its rings must operate on billion-year timescales," Debes said. "Most of the models scientists have created to explain rings around white dwarfs only work well up to around 100 million years, so this star is really challenging our assumptions of how planetary systems evolve." Adding to the puzzle, the J0207 disk may be composed of more than one distinct ring-like component, an arrangement never before seen in circumstellar material surrounding a white dwarf. To study the rings and their structure, Debes and Kuchner contacted collaborator Adam Burgasser at the University of California, San Diego to obtain follow-up observations with the Keck II telescope at the W. M. Keck Observatory in Hawaii. The Keck observations helped confirm J0207's record-setting properties. Now scientists are left to puzzle how it fits into their models. Debes compared the population of asteroid belt analogs in white dwarf systems to the grains of sand in an hourglass. Initially, there's a steady stream of material. The planets fling asteroids inward towards the white dwarf to be torn apart, maintaining a dusty disk. But over time, the asteroid belts become depleted, just like grains of sand in the hourglass. Eventually, all the material in the disk falls down onto the surface of the white dwarf, so older white dwarfs like J0207 should be less likely to have disks or rings. Follow-up with future missions like NASA's James Webb Space Telescope may help astronomers tease apart the ring's constituent parts. The publication of the paper in Astrophysical Journal Letters describing the white dwarf star and rings coincides with a major upgrade of the original Backyard Worlds: Planet 9 project. The database that volunteers search comes from NASA's WISE satellite telescope. WISE, which stands for Wide-field Infrared Survey Explorer, was launched in late 2009 and has mapped the entire sky numerous times over the past 10 years. WISE detects infrared light, the kind of light emitted by objects at room temperature, like planets, brown dwarfs - and dusty rings around white dwarfs. "We built Backyard Worlds: Planet 9 mostly to search for brown dwarfs and new planets in the solar system," Kuchner said. "But working with citizen scientists always leads to surprises. They are voracious - the project just celebrated its second birthday, and they've already discovered more than 1,000 likely brown dwarfs. Now that we've rebooted the website with double the amount of WISE data, we're looking forward to even more exciting discoveries." For ASU's Schneider, the more the better. "My job is to weed through the candidates found by the citizens, prioritize them for follow-up, and help organize the observations. It's like a front-row seat for discoveries," he said. Backyard Worlds: Planet 9 is a collaboration between NASA, the American Museum of Natural History in New York, Arizona State University, National Optical Astronomy Observatory, the Space Telescope Science Institute in Baltimore, the University of California San Diego, Bucknell University, the University of Oklahoma, and Zooniverse, a collaboration of scientists, software developers and educators who collectively develop and manage citizen science projects on the internet.